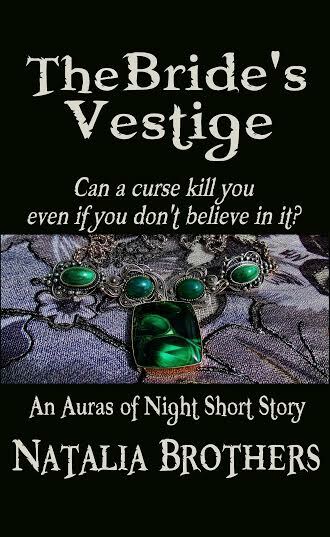 Peter Moss ignores little mishaps that start happening to him after he pockets an antique locket he discovered at a disturbed gravesite. Dark local folklore surrounds the grave, but Peter, a rational college student, doesn’t believe in curses. His nonchalant mindset crumbles when he learns that the locket could be the same as the one featured in a portrait of a beheaded woman. Fascinated and mortified, Peter rushes to see the painting. But whether or not mystic forces are behind the incidents, his intent to uncover the jewelry’s history might be the worst decision of his life. Crystallography was the hardest discipline I had ever had to study in college. Physics, math, chemistry-oriented German—no problem, but complicated three-dimensional crystal-structure models were absurdly difficult to recreate on paper as two-dimensional sketches (the purpose of that exercise still eludes me). Unfortunately, those sketches were the condition for being allowed to take the final test and finish the course. Have you ever faced a situation when no matter how hard you study/exercise/try, there’s no guarantee you will accomplish the task? My past year went like that. I signed a publishing contract, and jumping into the world of social media became an unavoidable necessity. The avalanche of things I had to learn hit me with crushing force. It was crystallography all over again. I had no idea how I was going to figure it all out. First, the technical aspect of any social media platform. Whether I was creating a blog, Facebook Author’s Page, or a website, it started with a big “Okay, how do I do this?” Learning how to set up an account, upload photos, add links didn’t require extensive technical knowledge but took time. Lots of it, because the amount of information was staggering. For example, have you ever participated in a Virtual Book Party? I was asked to enter such an event before I knew how things worked on Facebook, so I joined a “party” in progress to see what was involved. It lasts for hours. If someone comments on a post from two hours ago, that post jumps on top of the feed. You need to refresh the page to see new posts. Complicated? No. Takes time to understand what’s going on? You bet. Design. I never know what works best until I try it. One of many things that makes me comfortable as a Twitter user is that I can change my banner/cover photo all day long and it doesn’t inform my followers every time I do so. A header that took me hours to create looked beautiful—a wall of framed landscapes—but the number of my new followers dropped while I kept it posted. The header that works? The one with the title of my unpublished novel and the tagline. Content. A year ago, attending Pikes Peak Writers Night, I announced that I tripled my Twitter followers that afternoon: from a single follower my numbers jumped up to three. During the meeting, someone gave me a few tips on how that platform worked. I’ve been tweeting away ever since. I just celebrated my first anniversary with over 2,000 followers. 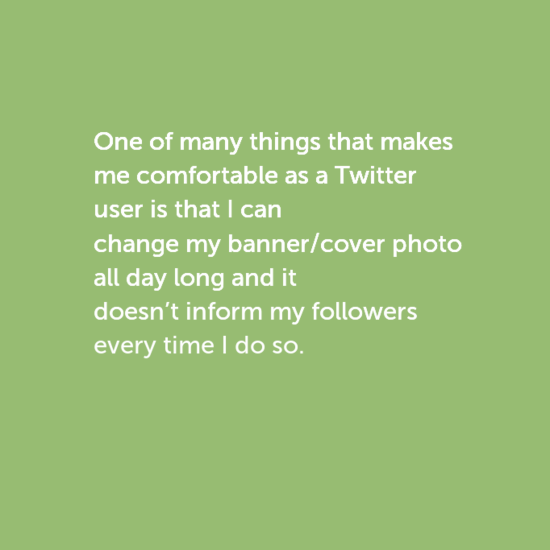 Of course it took time to learn, but I discovered several hashtags that allow me to connect with other writers on a weekly basis and showcase my writing style. I participate in #2bittues on Tuesdays and #1linewed on Wednesdays. The host announces the week’s theme, and authors post lines from their WIPs. A new hashtag was recently created for Thursdays, a similar idea but tailored for published works. Have you tried #Thurds? 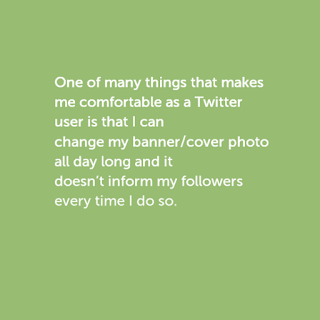 I recently realized that while on Facebook my friends saw plenty of my posts, on Twitter my hobbies—orchids, photography—were disconnected from writing. I wanted to find a theme that would show who I was with a “click of a button,” something that would link my dark fantasy genre with my other interests. Just like with crystallography years ago, when I persevered and passed the course, my year-long social media quest led me to an answer. 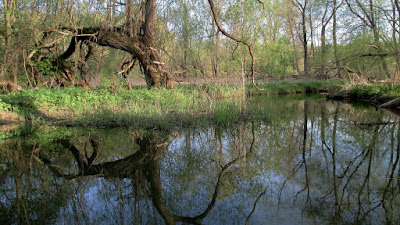 I chose a theme that always fascinated me as a storyteller and photographer: Atmospheric Settings. I created a new hashtag and use it daily to post pictures of places that inspire my writing. It has been an eventful year. I parted ways with the publisher; by the time this article is posted, I will either sign a new contract—or make a daring decision to go Indie. I’ve learned so much in the past twelve months. I have a lot more to learn. Would you say that social media is your second nature? Or is it more like what crystallography was for me? I doubt it will ever become my addiction, but I admit that I’m having fun. I hope to see you on Twitter. 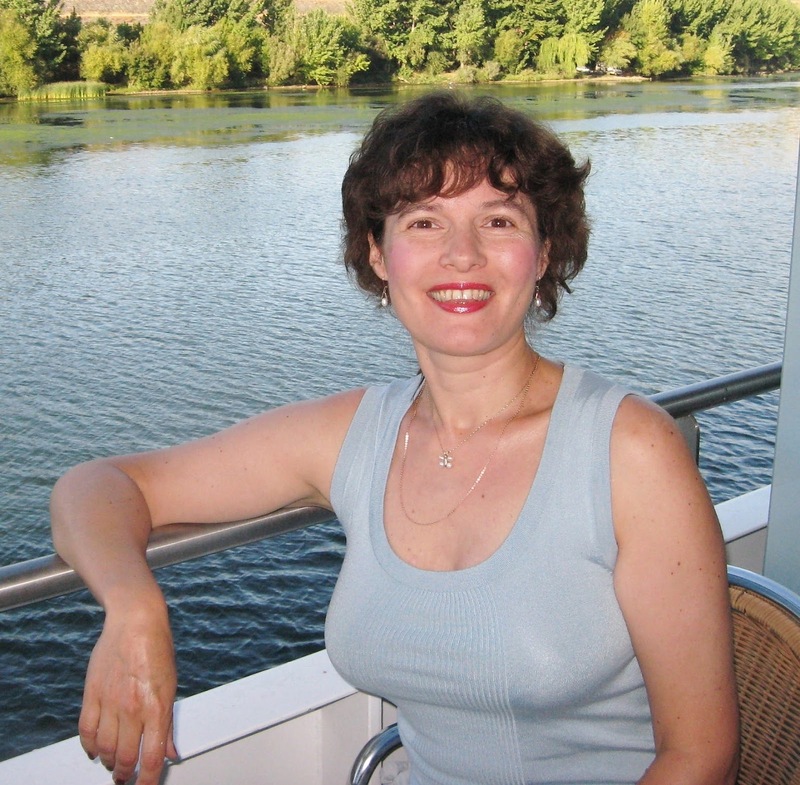 About the Writer: Born in Moscow, Natalia grew up with the romance and magic of Russian fairy tales. She never imagined that one day she’d be swept off her feet by an American Marine. An engineer-physicist-chemist, Natalia realized that the powder metallurgy might not be her true calling when on a moonless summer night she was spooked by cries of a loon in a fog-wrapped meadow. 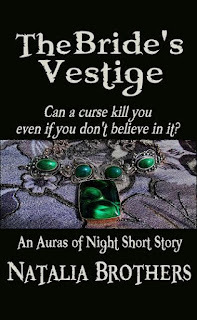 What if, a writer’s unrelenting muse, took hold of her. Two of her passions define her being. Natalia is an orchid expert and she writes dark fantasy. Reading Fees in the Short Story and Poetry Market? 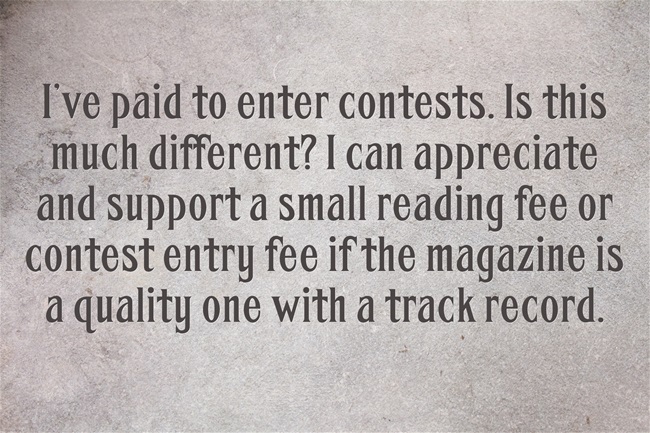 You’ve seen them, literary magazines with editors who ask for reading fees to consider your short stories. 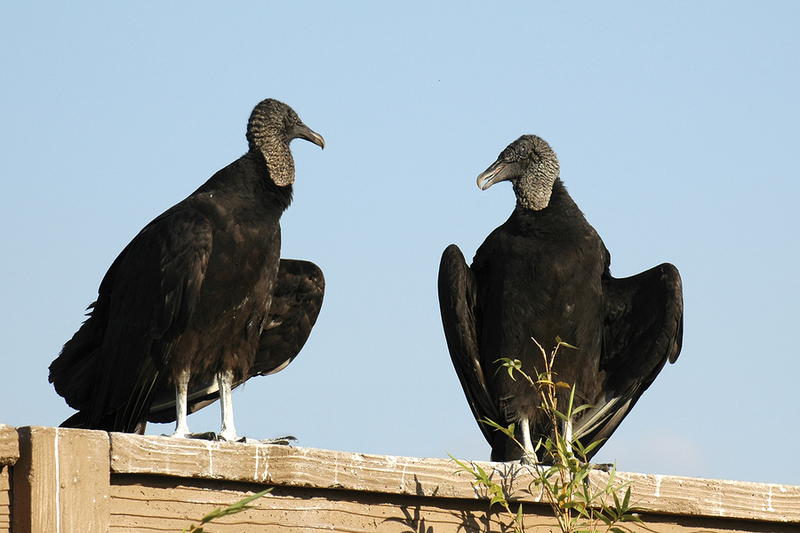 Are they vultures waiting on fences ready to prey on people's dreams? Are they victimizing those who aren’t seasoned writers ready to publish? I can’t help but wonder if it is human instinct to want to be immortal in some way, leave something of ourselves behind (even if it’s in the cloud ether). After being turned down by the lit mags that have no reading fees, isn’t it tempting to pay our way into publication? Is that what the charge is all about? It feels a lot like vanity-publishing a novel. We have the product, those words we’ve massaged into obedience. We should be paid, not the other way around. Right? Many of these lit mags make money off the stories they sell. It sounds as if they are taking advantage of writers, charging for a read without any guarantee of publication. Surely they know full well that most of those who send work in won’t ever see it in print or available online. Sounds like exploitation, right? Often it is. But then, I've been on the lit mag editor side of this equation. Four different university magazines. It was overwhelming how much was sent in. We didn’t charge reading fees. Maybe we should have. Sifting through piles and piles of submissions was a painful labor of love. But because of those experiences, I understand that the lit mag business can result in having no compensation and much agony. Requesting a little bit of money—often $10 to $15—to consider a short story or a group of poems naturally whittles down the number of submissions and pays for the time it takes to read and decide about the works’ worthiness or appropriateness for the magazine. I’ve paid to enter contests. Is this much different? 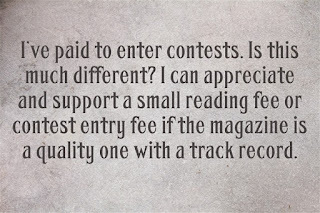 I can appreciate and support a small reading fee or contest entry fee if the magazine is a quality one with a track record (Glimmer Train comes to mind). But I’d hope a magazine or e-zine that charges to consider your work will give it a serious read and comment on it. Feedback is worth something too. Others will surely disagree and I can understand where they’re coming from. This is just one writer’s opinion. Famed author Nelle Harper Lee was born April 28, 1926- Feb. 19, 2016, in Monroeville, Alabama. Lee is best known for writing the Pulitzer Prize-winning novel To Kill a Mockingbird (1960), and more recently Go Set a Watchman, a novel set two decades before To Kill a Mockingbird. Ronnie Lee Graham’s second book, The Inventor, (ISBN 978-1-5127-3239-9 (hard), 978-1-5127-3238-2 (soft), 978-1-5127-3237-5 (e-book), 264 pages) was released on February 23, 2016 by Westbow Press, A Division of Thomas Nelson and Zondervan. In this christian fiction novel, the good side wins, but it is never that simple. It is available on Amazon, Barnes and Noble (web), Christianbooks.com, and other sites. 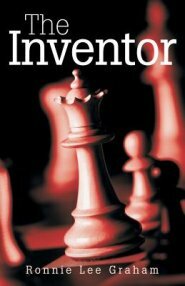 Visit Ronnie Lee’s website at http://www.RonnieLeeGraham.com, or the Facebook page for The Inventor at www.Facebook.com/TheInventorBook/. 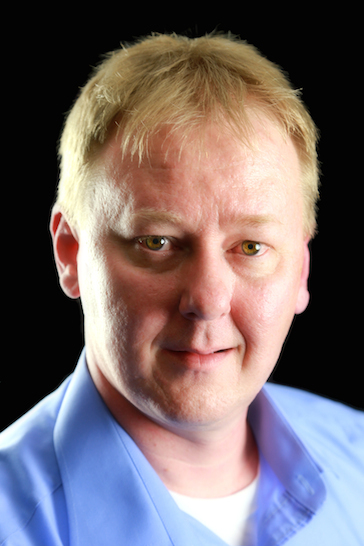 Robbert Gillan is a regular Joe with boyish good looks and outlook. He goes about his low level government contracting job dreaming of one day finding an idea that will improve the world. By contrast, the rugged and opportunistic General Mark Thomas is desperate to have a new innovation to build his legacy on. The General’s mistress, Minky, an auburn haired gold-digger who plays by her own rules, sets their paths toward conflict. Meanwhile, the General’s wife, Marge, is searching for something more meaningful and in the process learns the most powerful lesson of all. Ronnie Lee Graham lives in Colorado with his dog, Roadie. In his life, he has been everything from an Illinois farm kid fishing in the Mississippi river, to a military logistics advisor in foreign countries. Today, when not writing, he is most likely to be found running a local trail or doing volunteer work with a charity that gives bicycles to homeless persons. 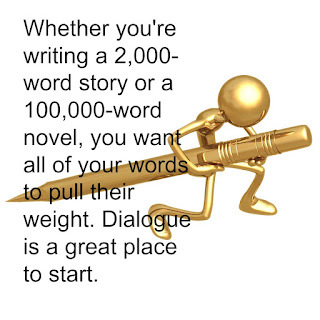 Dialogue is one of fiction's heavy lifters. It advances the story by conveying information, revealing relationships, showing socioeconomic status and expressing characters' moods. Really good dialogue will perform at least two of these functions in every scene where it appears. The best dialogue is also fraught with tension. And tension, as we all know, is what keeps a reader turning pages. Here's an example from Dennis Lehane's crime novel, Mystic River. In this short scene, a man phones his wife to tell her that the police have found the car driven by their missing teenage daughter. The scene is almost entirely dialogue, with only two tags and a single narrative sentence used to strengthen our emotional response to the father's horror. But the dialogue carries a lot of weight. In fewer than 30 lines, we not only advance the plot and gain insight about the characters, we get unexpected conflict. 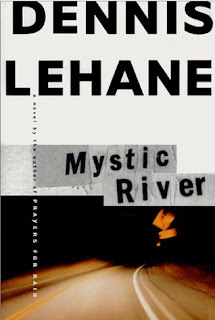 Lehane doesn't have to tell us anything about his characters. He shows it all through dialogue. "Baby," Jimmy managed before he had to clear his throat. "Jimmy?" A slight edge to her voice. "Where are you?" "I'm … Look … I'm on Sydney Street." "They found her car, Annabeth." "Yeah. She's … missing. In Pen Park somewhere." "Oh, Jesus God. No, right? No, no, Jimmy." Jimmy felt it fill him now—that dread, that awful certainty, the horror of thoughts he'd kept clenched behind a shelf in his brain. "We don't know anything yet. But her car's been here all night and the cops—"
"—are searching the park for her. Tons of them. So …"
"On the f---ing street? Why aren't you in there?" "They won't let me in." "They? Who the f--- are they? Is she their daughter?" "You get in there. Jesus. She could be hurt. 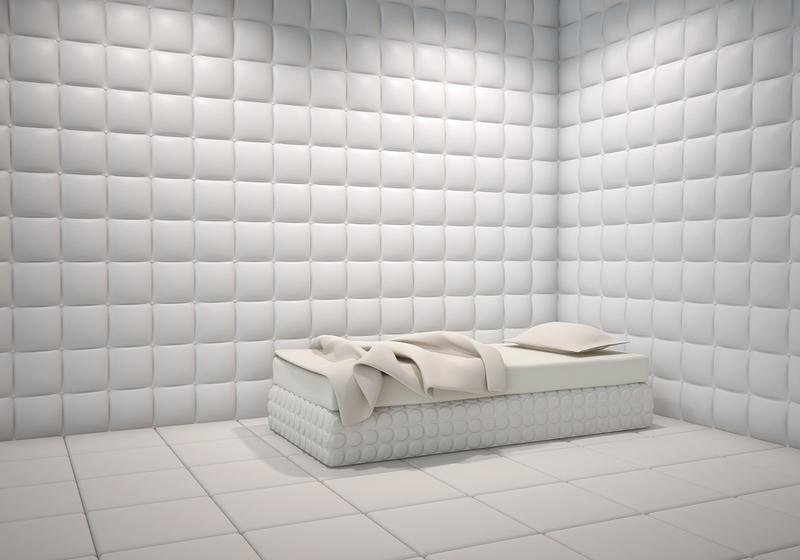 Lying in there somewhere, all cold and hurt." "Get in there, Jimmy. I mean, God, what's wrong with you?" What does Lehane manage to accomplish in this brief passage? He gives us information. One character tells another character something she needs to know. We learn about the characters. We see what a tough woman Annabeth is, and how little she cares for rules or laws when it comes to her family. She shows us she isn't afraid to push around her husband, a tough ex-con. And we see this tough ex-con's vulnerability when it comes to his daughter. We get a sense of these characters' socioeconomic status through Annabeth's language. We can figure these characters aren't college professors. They're people who've had to be tough to survive their neighborhood, and they're familiar with being on the wrong side of the law. Annabeth's use of "Jesus God" and "Jesus Christ" emphasizes her Catholic upbringing. We participate in the raw pain of parents who probably aren't going to get good news about their daughter. That's an emotional payoff for the reader. And most importantly, there is tension. Lehane could have had the mother sink to the floor, weeping. A painful scene, but not necessarily one that grips us. Instead, he creates conflict when she attacks her husband, shaming him for letting the police keep him out of the park. This shaming goes beyond telling us about the characters and their relationship. It has repercussions that ripple through the rest of the book. In the first draft of your novel, it's probably enough to use dialogue to convey information, whether your characters are saying, "I love you" or "The Martians are coming." Get down the basic scene. 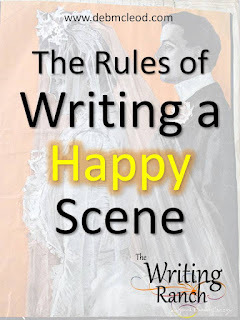 Then, on subsequent drafts, look for ways to add tension and character development by focusing not only on what the characters say to each other but on how they say it. And why. 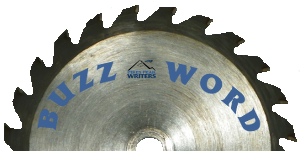 Whether you're writing a 2,000-word story or a 100,000-word novel, you want all of your words to pull their weight. 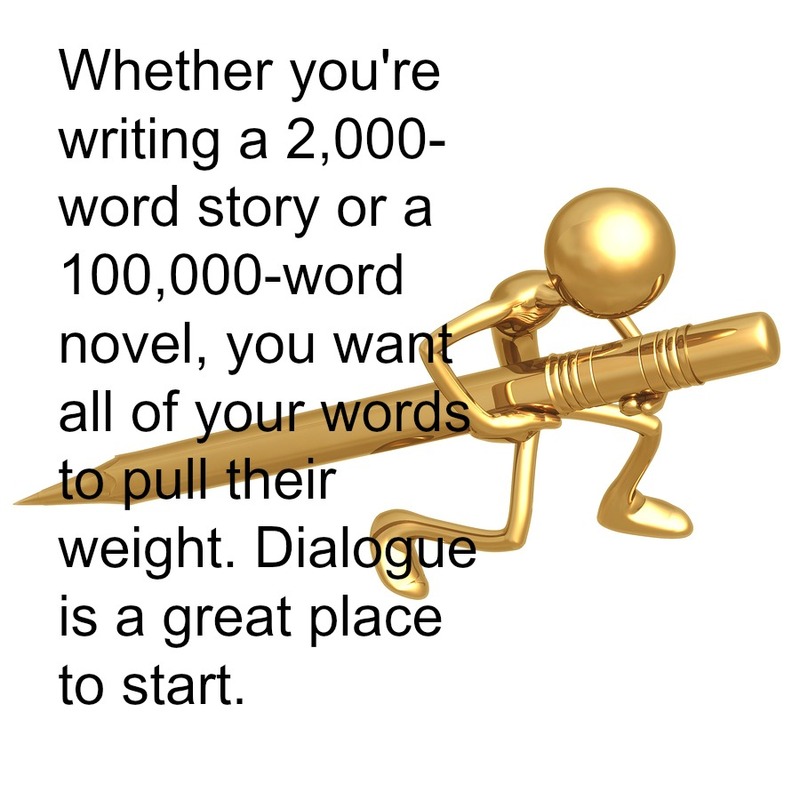 Dialogue is a great place to start. 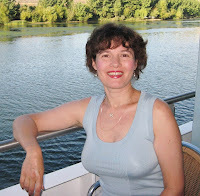 About the Writer: Barbara Nickless is an award-winning author whose short stories and essays have appeared in anthologies in the United States and United Kingdom. 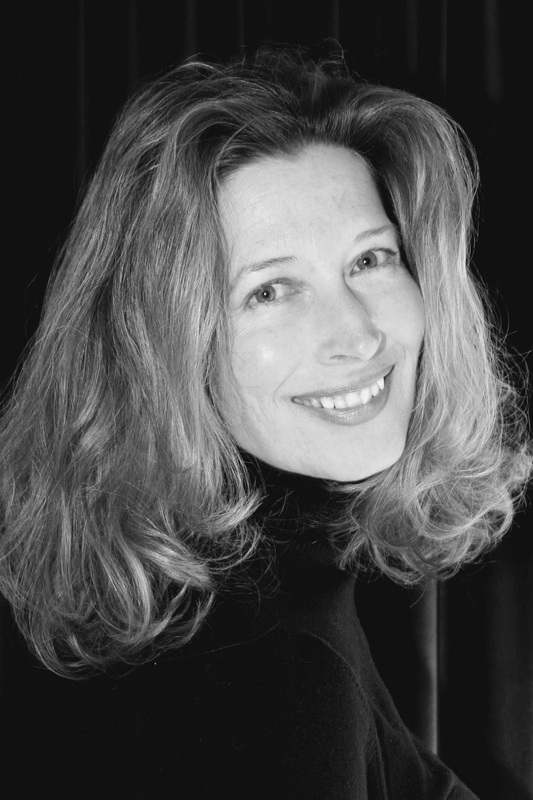 Her debut novel, Blood on the Tracks will be published by Thomas & Mercer in August 2016. 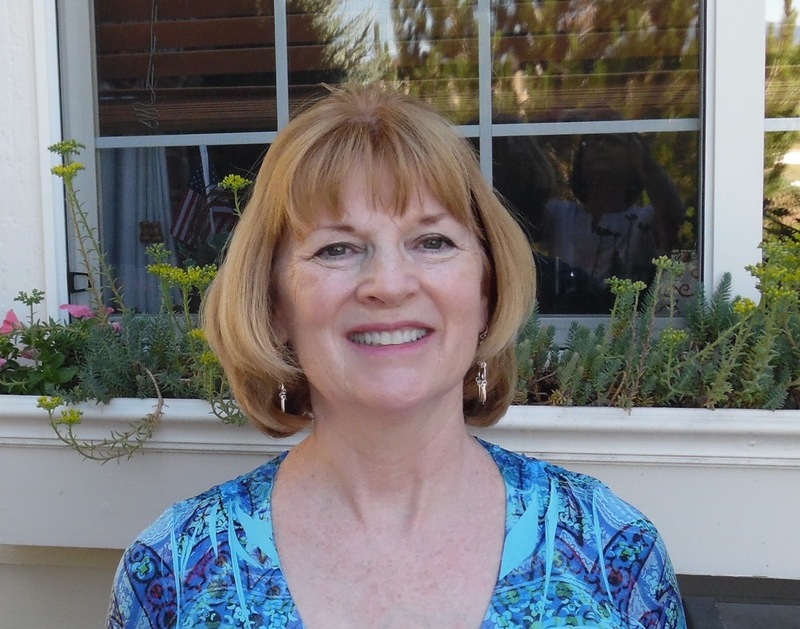 When not plotting how to hide a body, Barbara is a culinary enthusiast who enjoys hiking, caving and snowshoeing in the Colorado mountains. Visit her at www.barbaranickless.com. Do your characters seem to be missing that spark? Are they feeling flat as the paper they are being written on? Maybe you need to do an in depth profile of that character. You already did one? You might consider refreshing it. Once you have answered these questions delve even further. When faced with a life or death situation, how will they react? Take care that the reaction belongs to the character and not to you. Ask yourself why the character is behaving the way they are. What life experience would result in them running away rather than drawing a sword and fighting to the death? Was it from past experience they know not to fight an ogre three times their size, or were they kidnapped and tortured by an adult who left an ogre-sized shadow in your character’s memory? Don’t forget they are more than just consciousness on a page. For them to truly fill their lungs they need air to breathe, an environment that fills their senses. 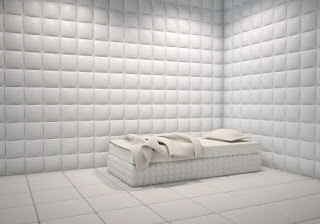 If they were to close their eyes how would the room feel to them? Do they lose their sense of balance with closed eyes? What do they smell, taste, feel on their skin? Dig deep into them. Go beyond the five senses and explore their intuition, those gut feelings. An ache deep in a person’s belly can reveal the depth of their emotions. How does their body fit into the space they stand? 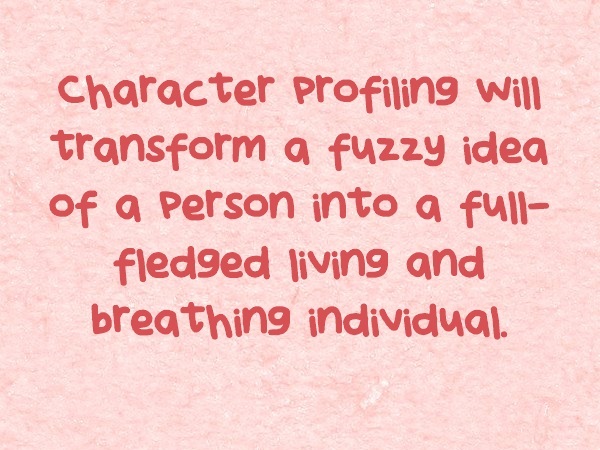 The further you climb into a character’s mind and body the deeper they will breathe. If you are outside, what are you most likely to do? What is your most treasured thing? Have you ever caught a butterfly? What was it like? Understand every nuance, innuendo, and attribute of your main players. Give them a background, a scope, and a point of view. 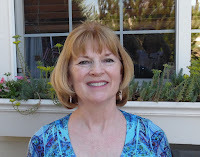 With extensive knowledge of your characters they will rise off the paper and fill your reader’s imagination. 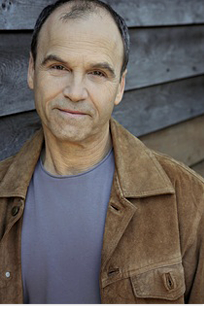 Scott Frederick Turow, born April 12, 1949, is an American author and lawyer. Turow has written nine fiction and two nonfiction books, which have been translated into more than 40 languages and sold more than 30 million copies. 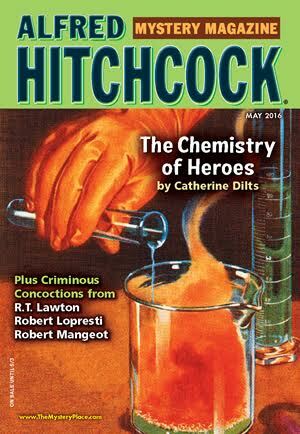 Catherine Dilts is pleased to announce the publication of her short story, “The Chemistry of Heroes,” (March 28, 2016, Alfred Hitchcock Mystery Magazine, available at Barnes & Noble. Subscriptions for hardcopy or electronic versions: https://www.themysteryplace.com/order/order_ahmm.aspx). This is the second tale starring Charles, an African American chemist at a small manufacturing company. He is accompanied once again by his college intern sidekick Tony. The story made the cover of Alfred Hitchcock Mystery Magazine, which, to short fiction authors, is comparable to a musician making the cover of Rolling Stone magazine. The May issue went on sale March 28, 2016 and should be available through April. Every story promises to be a treat in the annual humor issue, which also features Colorado author R. T. Lawton, and Derringer Award winning Robert Lopresti. 1) Limit the use of “to be” verbs. Okay, but if you are writing in close third person with one POV character, the only way to get certain scenes across is to have them reported by another character. That character will necessarily use the verbs “was,” were,” and “had been” to relate that scene in which your POV character was not present. 2) Keep things in the present. Action. Action. Action. Good advice, usually. But same problem here if one is in the situation explained above. 3) Provide conflict on every page. Really? How then might the author portray a character’s personality if he or she is not an S.O.B.? A character who is kind, generous and admirable (of course he has the required faults also) will have situations that are pleasant in order to display this characteristic. Think Atticus Finch in endearing scenes with Scout. Peers have suggested the creation of a storm for conflict during such scenes, but isn’t that just gratuitous conflict that feels like author manipulation? What does it have to do with the story? All of my chapters contain conflict but not every scene. 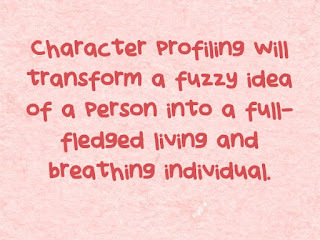 I’m still trying to figure out how to fulfill this requirement while keeping to my storyline and character profile. Especially in scenes with subplot resolutions. Can’t we give our characters a break and let them have a few pleasant days or portions of days? We do have them in real life. 4) Rivet your reader with deep point of view. Wading through books on writing technique, attending critique sessions, and searching volumes of notes on writing advice — some of it seemingly conflicting — can be daunting. But we push through, write and rewrite, and finally produce a manuscript that we believe meets the multiple requirements. Then what? One more piece of advice: Read your chapters out loud. Find a time when the family is gone and you are undisturbed. Have a glass of your favorite beverage nearby (nonalcoholic preferably). You’ll need it. This project can prove challenging for the vocal chords. Amazingly, a manuscript read aloud discloses weaknesses we’ve overlooked. We find typos, misspellings, and words that are poorly chosen. 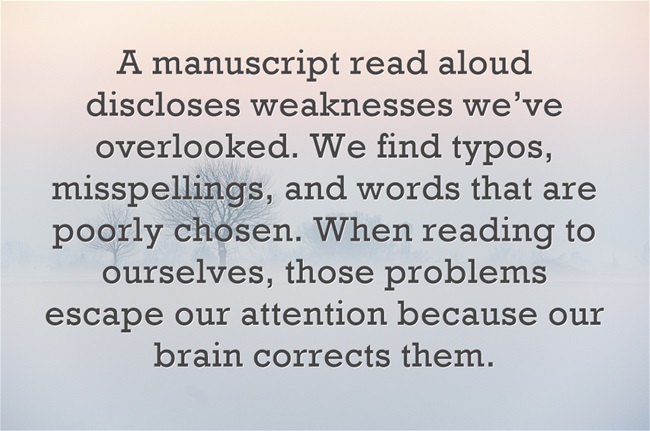 When reading to ourselves, those problems escape our attention because our brain corrects them. But when we read them aloud, they jump off the page like an animated word from a preschooler’s Sesame Street episode. Suddenly we become aware of phrases or sentences that are cumbersome or downright convoluted. So have a red pen handy. That brings up another point: read from a paper copy. This helps identify areas to polish far more effectively than reading from the computer, particularly in locating missed quotation marks, forgotten periods or undeleted additional punctuation marks after making edits. This oral test is a must for finding errors in syntax. Sometimes a sentence flows better with minor changes, a moved adverbial phrase, for instance. 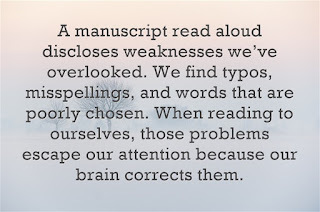 If an author’s sentence patterns are all too much the same, he’ll notice this fact when reading aloud. What could be more boring than reading a work filled with subject, verb, and complements always in that order? What about the story’s progression? Perhaps a sentence needs to be moved so that ideas or events flow naturally. Inexplicably, this mistake in order becomes astonishingly more apparent when one’s written words meet his ears. Completing this project with an entire manuscript will require a significant investment of time, but the venture is straightforward and relatively simple to perform. This last prudent step before releasing a book into the hands of agents and editors might spare an author later regrets. An author yearns to hear, “Your prose flows like poetry. It’s a pleasure to read.” One final oral audition may be the very assistance necessary for a writer to achieve such coveted praise. New writers who become frustrated with seemingly unyielding rules as I was, need to take hope. While mindful of the rules and writing advice, apply them where they help you achieve goals, but set them aside when they are simply not applicable. While most advice has validity, you must not allow rules to stifle your creativity or storytelling ability. This month, I'm going to cover repetitive sentence structure. The way you put words together to tell your story creates a rhythm to the way the reader feels the words impact them. Using different types of sentence structure is a subtle way to control your readers' reactions to the way you tell the story. It also can reveal a great deal about the point of view character. If you stick with the same sentence structures, the reader will almost fall into a hypnotic pattern. Their reaction will be along the lines of, "This is a good story, but I'm bored." They won't be able to put their finger on it, but do we want the emotional reaction to our stories to be "bored?" Probably not. I hope not! A talented critique partner, beta reader, or editor will be able to spot these rhythmic patterns. A really good critique partner will not rewrite your words for you. They'll simply point out the patterns you've fallen into and let you run with the fixes. I'm not saying any one of these is a bad thing. They're actually good things! However, when clustered in a dense group, it can throw off the reader. As a side tip that goes along with these, you can control the rate at which someone reads by varying your sentence structure. When I describe a new environment my character is experiencing, I tend to use longer sentences. This forces the reader to slow down to process the expanded descriptions. This gives the impression that the character is studying the area as much as the reader. It naturally slows the pace of the story. When I get into a high action scene, I intentionally drop to shorter, to-the-point sentences. These are easy to process for the reader. Therefore, the fight scene or verbal argument or dangerous situation reads fast. This fast-paced reading imposes onto the reader the sense that the action is fast as well. These are cheats where you are "hacking your readers' brains," but they work so well. I don't have any mathematical or proscribed ritual to changing things up. There's no set pattern of "long-long-short-long" or "short-long-long-short" to keep a steady rhythm to the reading experience. This isn't Morse code, after all. This is an art. It has a flow, a style, a heartbeat of its own. Find your beat, change it up, and get your readers to dance to it! Jim Robbins is a dead man. He’s fought Yankee and Pawnee, fought for the love of two very different women, but as the scenes of his life flash before him, his greatest struggle is about to begin. Wounded in a railroad explosion, Jim reviews those moments that shaped him. From the horrors of the Civil War, to the juggernaut of westward expansion, he played his part in the events that forged a nation—and not always for the better. Can one man truly make a difference, or is his life merely a stirring of ashes and dust? 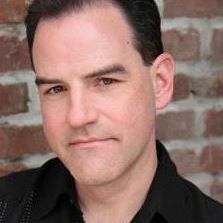 Marc Graham is an actor, singer, bard, engineer, Freemason, and whisky aficionado (Macallan 18, one ice cube). When not on stage, in a pub, or bound to his computer, he can be found traipsing about Colorado’s Front Range with his wife and their Greater Swiss Mountain Dog.